Recipe by Emily Cooper of Sinful Nutrition. In a small bowl, combine sugar and cinnamon. Set aside. On a large sheet tray, spread out corn tortillas. Spray lightly with cooking spray, and sprinkle with cinnamon sugar mixture. Turn tortillas over and repeat. In a large bowl, add cream cheese, yogurt, milk, vanilla, sugar, and lemon zest. Beat with hand mixer until light and fluffy. ~ 3 minutes. Place one tortilla on serving plate. Top with a spoonful of cream cheese mixture, and spread evenly. Repeat with remaining tortillas, leaving the top without filling. Refrigerate for at least one hour to set. In a small saucepan, add frozen blueberries, lemon juice and water, and heat on high. Bring mixture to a boil, and cook until thickened. ~3-5 minutes. 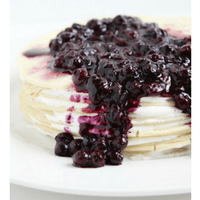 Remove cake from refrigerator and top with blueberry sauce before serving.